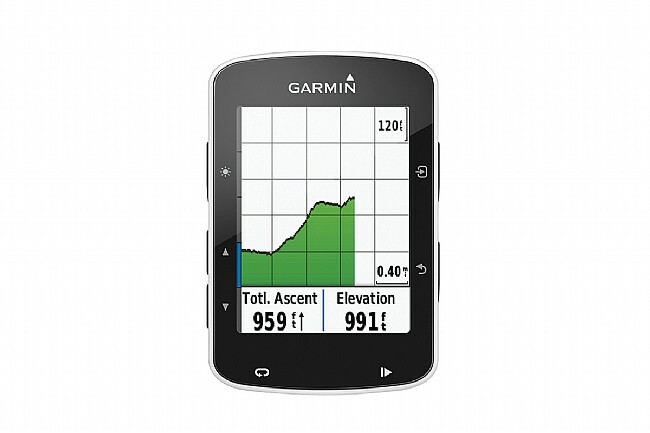 This is the Garmin we've all been waiting for. 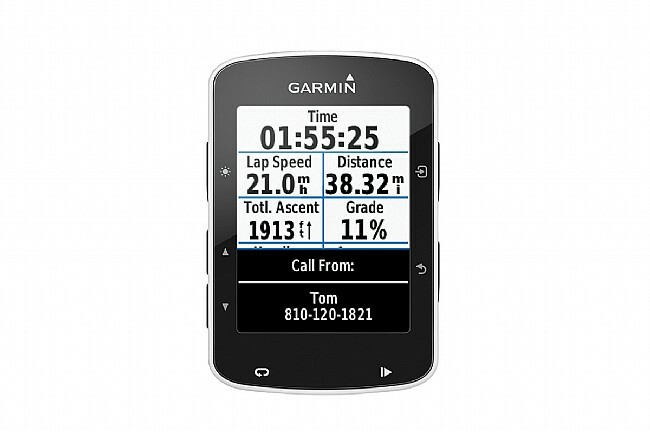 The Garmin Edge 520, with 2.3” of vibrant high-resolution color screen, features enhanced mapping capabilities, text and call notifications from your phone, and topping it all off, integrated Strava Live Segment functionality so you can complete segments and follow your progress in real time. Talk about taking virtual racing to a whole new level. The new display provides clarity in all lighting conditions, and with the 520, Garmin has gone back to tactile buttons instead of a touch screen for a simpler and more consistent interface. The Edge 520 adds Garmin's Basemaps for basic full-color maps of the surrounding area, and it's also compatible with more detailed third-party maps so no longer will you have to try and connect the dots like with the previous free-floating routes on the Edge 500 and 510. Like always, the use of both GPS and GLONASS satellite reception minimizes interruption in tracking, even under tree cover, for accurate navigation and recording. When connected to an ANT+ heart rate monitor and power meter, the Edge 520 also calculates VO2 max and recovery information as well as FTP tracking and wattage. Use with Garmin's Vector power meter pedal systems opens up additional metrics with Cycling Dynamics, providing left / right specific power, pedal stroke efficiency, and more. The Edge 520 is also compatible with ANT+ capable indoor trainers for riding at a set power or automatically adjusting the trainer's resistance based on a preloaded elevation profile. Bluetooth smartphone pairing allows for text and call notifications right on the Edge 520's display, and Live Tracking makes it easy for friends and family to follow you along on your ride from their desktop. When all is said and done, Bluetooth pairing also makes it easy to automatically upload your ride straight to Garmin Connect without having to plug into a computer. Additional connectivity options include compatibility with Shimano Di2 electronic shifting, Garmin VIRB® cameras, and Garmin Varia Smart Lights and Radar. Measures 1.9” x 2.9” x 0.8”. Claimed weight is 60 g. Battery life is rated at 15 hours. Waterproof to the IXP7 standard. Note: Use of Strava Live Segments requires a subscription to Strava's Premium membership in order to download segments to the device. The Edge 520 has everything I needed from a GPS at a good price. It has a water resistant build, easy to read and customize display, and compact. For me the deciding factor was having actual buttons (as opposed to a touchscreen) that allows me to use the unit in colder weather with full finger gloves. Just updated from the Garmin 500. Great new features worth having. Rock solid performance. Finally replaced my Garmin 500 with the 520 and love the new features. Rock solid performance. Still need a wheel sensor in the woods for accurate speed and distance. Horrible set of instructions. I bought with hesitation because my Garmin 510 was doing just fine. I am so glad I purchased the Garmin 520. It's easier to use, it's interface is more user friendly, there's no delay in uploading rides, the maps are better, it's by far a better bike computer. I do not like the idea of touch screen so 520 fits me well. My only complaint is the battery life, I wish it could last longer. I'm a strava junkie. Bought this because of live segments. Garmin doesn't mention that u need to be a strava premium member. Also don't mention that you can only have 100 segments loaded on the device. I found this out after waiting on hold with garmin for over a 12 hour. This means that I need to constantly add and delete segments depending on where I'm going to ride. There should not be a limit to how many segments can be loaded onto the device. I want to ride my bike, not sit at a computer. So if you travel like me and want to ride in a new area, then forget about live segments unless you took the time to load them onto the device. Again, more computer time, less riding. I am very disappointed with Garmin. Western has always been great. 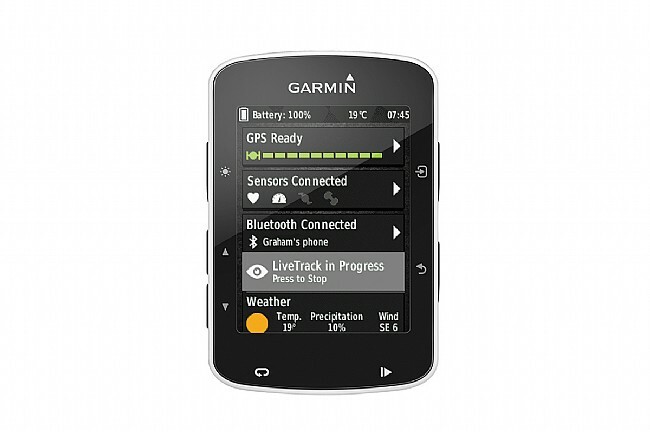 I have used the Garmin 520 six days a week since it was introduced. It is simple to use and straightforward in it's functions. I particularly enjoy the effortless ride uploads to Strava and the notifications showing the person calling or texting to my cell phone. The 520 is a robust, no-nonsense computer that has far exceeded my expectations. The 520 is admittedly compact and lightweight but its interface is unintuitive and opaque. Quite obviously, the Garmin programmers never worked at Apple, for every function however rudimentary requires annoying scrutiny and multiple button pushes. Also, having large hands like Bart Simpson certainly doesn't help! This is a great product, as expected. It pairs nicely with the Garmin Vector 3, Garmin Varia Radar, and my iPhone. The only complain is that they launched a newer version (520 Plus). With products like this, the only limitation will be your budget. Overall the 520 is a solid buy. I would describe the 520 is a smaller slightly simpler version of the 8001000 with 90% of the stuff you want and need. It doesn't have touch screen like the 8001000 but the side buttons aren't that hard to use. Screen isn't as big as the 800 but it plenty big. I haven't ran the battery all the way down but after 6hrs it's still at about 60%. I downloaded Garmin Connect app for my iphone, to which the 520 connects to wireless. So after each ride I open the Garmin Connect app to pull the ride data off the 520 which in turn talks directly to and uploads each ride to Strava. Caught this on sale from Western Bike Works and at that price I think it's an absolute bargain. Customer service of WBW was great. I actually missed the sale by 1 day...called them and the representative gave me the deal anyway. So far very pleased with Western Bike Works as well as the Garmin 520. I would highly recommend both! ive tried the wahoo element bolt and still prefer harmons to other GPS units. The 520 is perfect sized and isnt an ipad at the front of your bike. 520 also got rid of the 510 stupid touch screen ! 520 is a great unit and it hasnt slipped a beat for me! I love all the information that the Garmin 520 provides and how easy it is to set-up the screen just the way you want it. I do mostly Time Trials and I used to use a Joule GPS and the Garmin screen is much easier to see especially when your sweating so much in your aero helmet . Perfect size and all the functionality I need. Would purchase again - no issues. I want to like this computer so much but its turned out to be a huge disappointment. Upgraded from the 810 mainly for the smart notifications feature but must return it because the touch screen has a mind of its own. Not had the issue of it scrolling on its own like so many others on the garmin forum. Just cant swipe 50% of the time for no rhyme or reason.